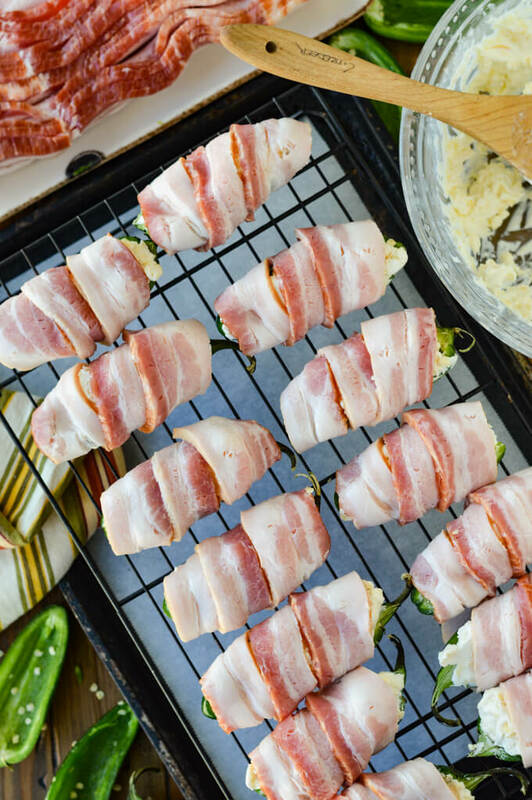 Jalapeño Poppers know how to bring some heat to a party. 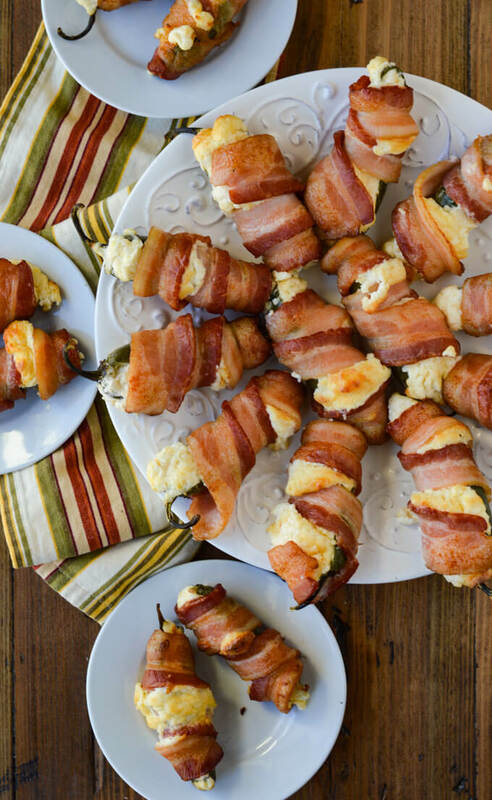 These bad boys are overstuffed with cheese and wrapped with thick center-cut bacon to make an indulgent appetizer for any get-together. 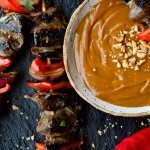 This recipe makes 24 extra large poppers. But still, that might not be enough for your ravenous guests. A warning Label is attached: Extremely Addictive. There are some things I just can get enough of. Coffee dates with my husband in the quiet of every morning before the day gets crazy. Cuddle times with my two affectionate golden doodles named Sammy and Charlie who love to be loved. The aroma of freshly baked bread straight out of the oven and smothered with butter. 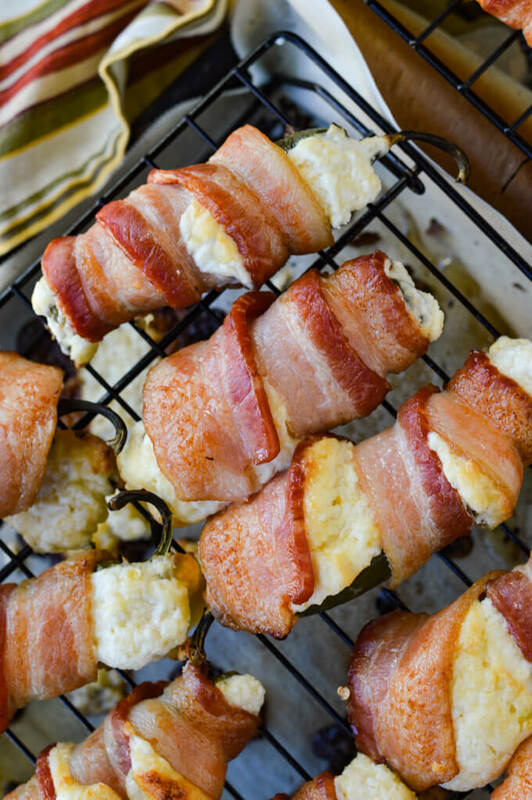 And of course, bacon wrapped, cheese stuffed jalapeños that destroy my willpower to stop eating. 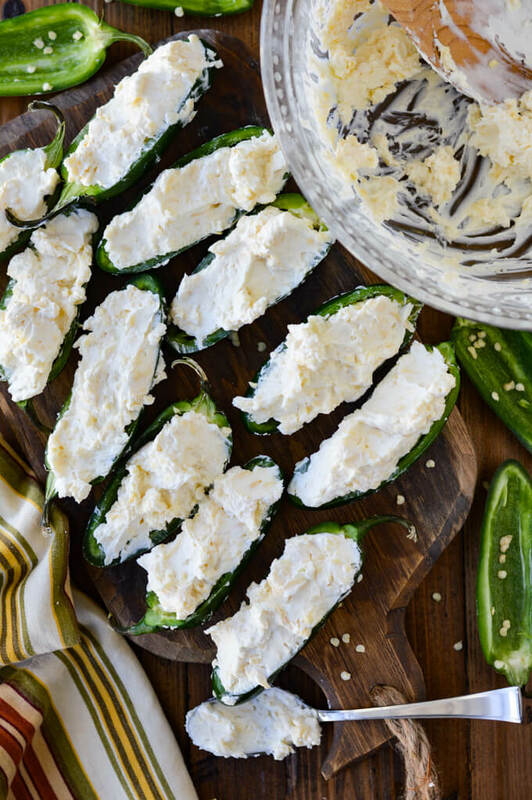 These Jalapeños Poppers have a smoky aspect to them which adds to the overall flavor of the bite. 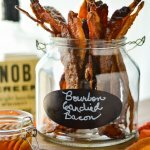 Smoked gouda and hickory smoked bacon contribute to that outcome. I never thought you could really improve on the “classic” popper, but these ingredients elevate it just a bit. 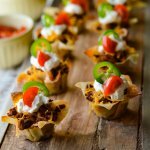 Because they’re a finger food, they’re the perfect appetizers for parties. No utensils needed. You can throw ’em on a tray and every time you or your guests walk by, grab and go. It keeps the movement and mingling happening around the room. 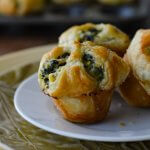 You might want to add some napkins though, these little darlings can be a cheesy mess. 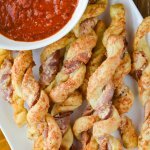 Although it takes a little bit of prep time, these appetizers are super simple to make with only four ingredients total. There’s no expertise involved in getting these ready to go into the oven. It’s basically cutting them in half and spooning out the seeds and membrane, which is probably the most time-consuming part of the prep. Then stuff, wrap and bake. No sweat, well, except when you eat ’em. The different textures of these poppers are what make them so alluring. 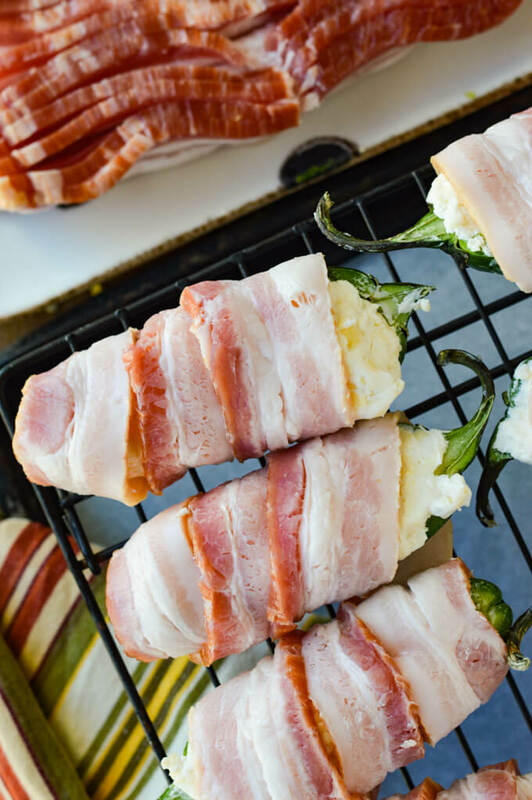 Between the creamy, silky texture of the cheese, the crunchy but chewy nature of the wrapped bacon and the tender bite of the jalapeños, you’ll create an addictive craving that will not soon go away. There’s a fiery kick that the jalapeños bring to the table. Depending on how much heat you like, you can choose a younger milder pepper (see below for what that looks like) or you can leave in some extra white pith, which carries more of the heat. If you like them really hot you can choose an older jalapeño (see below for how to pick them) that will assure some extra fire. 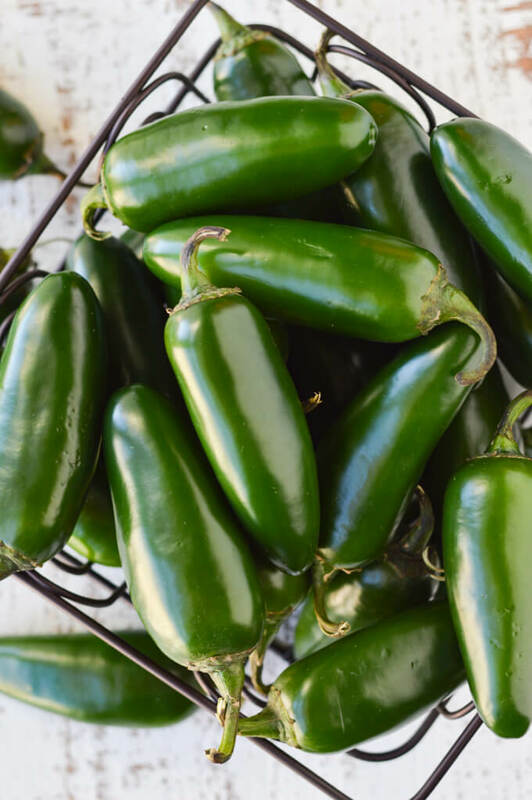 How to choose the best jalapeños. There is a way to find the right amount of heat without playing Russian roulette when choosing jalapeños from the grocery bin. If you want a milder pepper, choose those that are bright green, plumb, and smooth in texture. These are the younger jalapeños. With age comes lines, wrinkles, and spiciness. (Sadly, that feels very familiar to me.) It is the same with jalapeño peppers. The longer they age, the spicier they become. 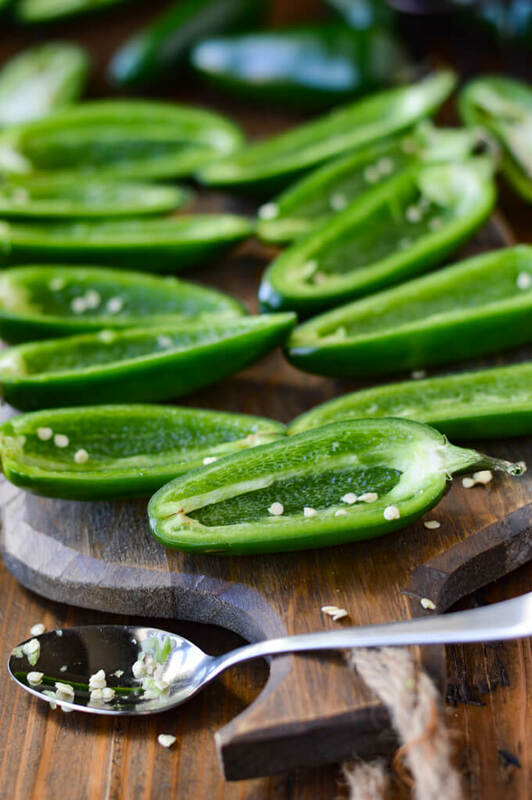 If you’re looking for extra heat in your poppers, choose jalapeños that have white lines down the pepper, are a little wrinkly and shriveling just a bit, which all indicates they are older and hotter. I wanted to jazz things up a bit with these poppers by adding some smokiness to them. So I used smoked gouda with the cream cheese. To make my job easier, I picked a round of gouda cheese that its coating could be eaten. It makes shredding so much easier. Not the gouda that has the man-made red wax on it. Those have to be peeled off and are not edible. I also picked up a package of hickory smoked bacon which complimented it as well. You can use whatever cheese with the cream cheese you like. Add some more spiciness by choosing shredded pepper jack. A nice all around good choice is always sharp or mild cheddar. Whatever substitute you use, it needs to have a good melting quality but somewhat firm to give the poppers body. You don’t want it running all over the pan before you ever get it to your face. How much heat do you want for your Poppers? For this recipe, I went with the younger jalapeños that were extra large because I wanted them nice and plump. Because our family likes hot things, I left some of the white pith in the center when I spooned out the seeds and ribs. The ribs and the white pith are what actually holds the heat of the jalapeño. I’ve recently discovered that the seeds themselves have no heat at all, only that they are associated with the ribs themselves. Don’t go by the photo (above) of me spooning the insides out without gloves. Do what I suggest, not what I do, please. The result … I had a burning sensation on the surface and under my skin for probably 12 hours, literally, like it was on fire. Stupid! And I can’t even tell you how terribly my eyes burned when I tried to take out my contact lenses that night. Again, stupid. Even the next morning, when I put them back in, my eyes felt the sting. The moral to this story, wear gloves. You can cut off the stem if you like. But I think it adds some character to the end product, so I left them on. I tried to cut through them so both halves would show the stem. Sometimes it worked and sometimes it didn’t. 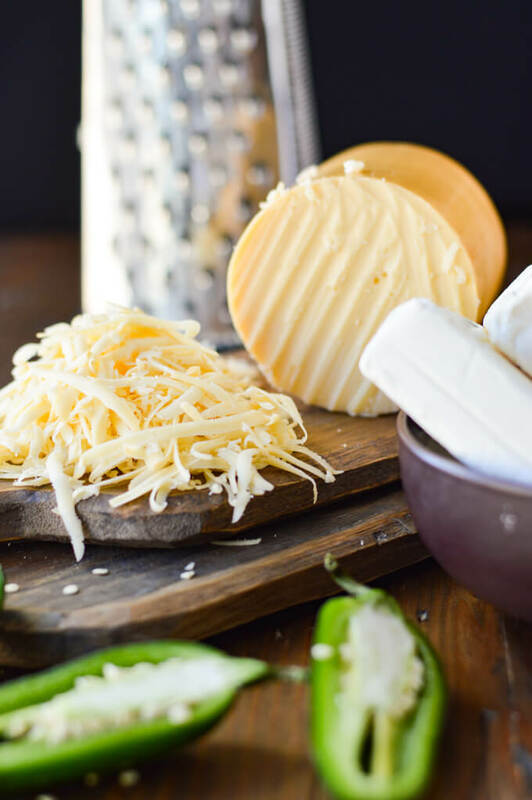 The cheese mixture consists of two simple ingredients: cream cheese and shredded smoked gouda. That’s it! I know! 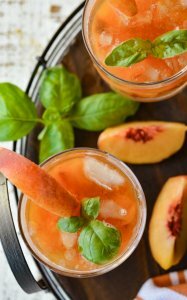 It’s crazy how easy this recipe is. I filled the jalapeño halves quite full, to heaping actually. Because if I’m gonna splurge on cheeses, I want to taste them. And no reduced fat cream cheese, please. You’ve already agreed to dive into indulgence with these, you might as well go all in and dive in deep. You can address the gluttony tomorrow. I used a whole slice of thick bacon for one jalapeño popper. Why? Because I personally don’t like wimpy poppers. And if I’m gonna binge on bacon, then I want to taste it. With the extra large jalapeños and the heaping amount of cheese mixture, you don’t want the bacon to get lost in the mix. I also chose center-cut bacon because it is a leaner cut and doesn’t shrivel up as much when cooked. 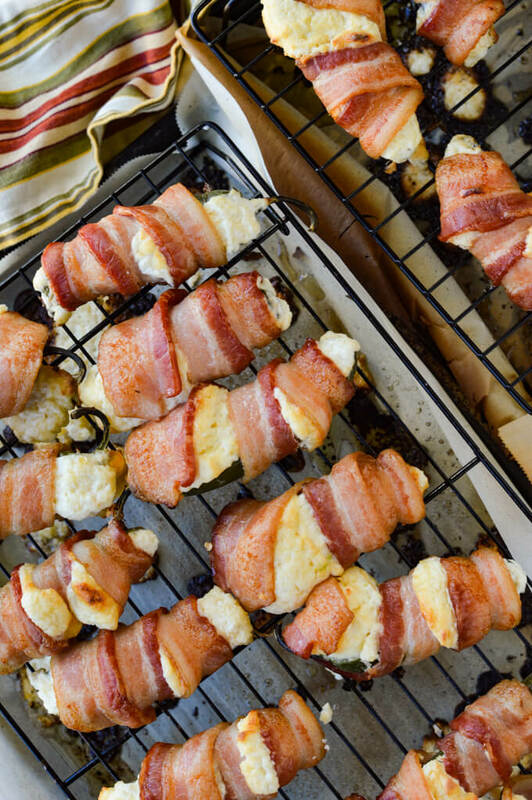 Wrap it up with lots of BACON! If you decide to go with a smaller jalapeño, you could possibly cut the bacon slices in half. 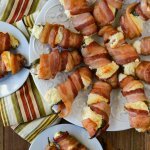 You want the poppers well covered though when wrapping them with bacon. If you look at the photo you can see that they’re fully enveloped. But you will also notice in the pics below, when cooked they allow the cheese to peak out. It’s not too much bacon. But can there ever be too much bacon? Start at one end of the jalapeño and wrap the bacon around about 3 times to the other end. Both bacon ends should be tucked under the bottom of the pepper with the cheese side up. There’s no need to secure them with toothpicks. The bacon, when it cooks up, tends to cling to the poppers especially if they’re secured well under each end. I baked these on a wire rack over a parchment covered cookie sheet. 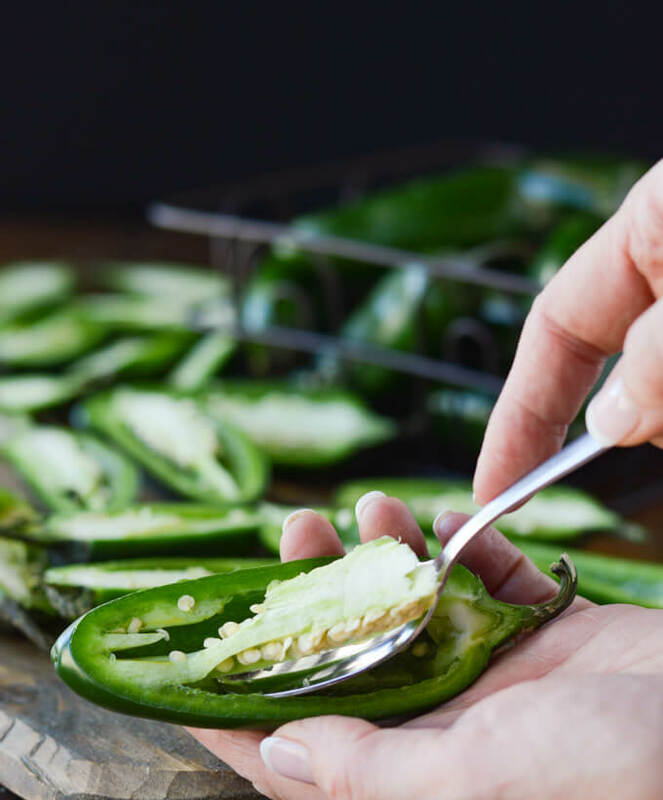 It helps the heat permeate all around the jalapeño poppers and cooks them evenly. I started them in a 425°F oven for about thirty minutes because I wanted the bacon to get a decent crisp to itself. I turned the heat down to 375°F and continued cooking them for another 20 minutes. The perfect amount of time and heat. It was the perfect amount of time and heat from my oven and for these delightful bites. The bacon was nice and crisp, the cheese bubbly and slightly browned and the jalapeños were the precise tenderness. You’ll want to watch the first batch to find out how your oven cooks the poppers because every oven is slightly different. Look at these gorgeous beauties. I can’t even begin to tell you how amazing these turned out. But maybe you’ll understand if I tell you how many I ate in one sitting – six extra large ones. Did I say in one sitting? Yea, I did! No regrets here though. Creamy, luscious, salty and spicy all in one bite. 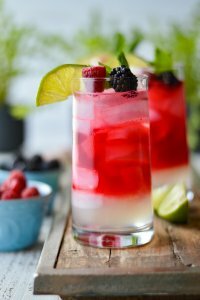 You gotta make these, like, right away. This afternoon, even, if possible. If a picture is worth a thousand words, then here, my dear friends, is my thousand-word thesis on Cheesy, Bacon Wrapped Jalapeño Poppers. Now, excuse me while I go eat another six of these. Awesome stuff. 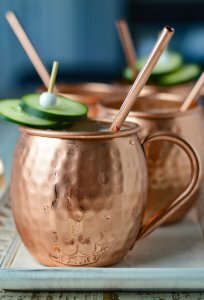 I love these and love the way you entice your readers with your writing. Thanks so much Craig!! 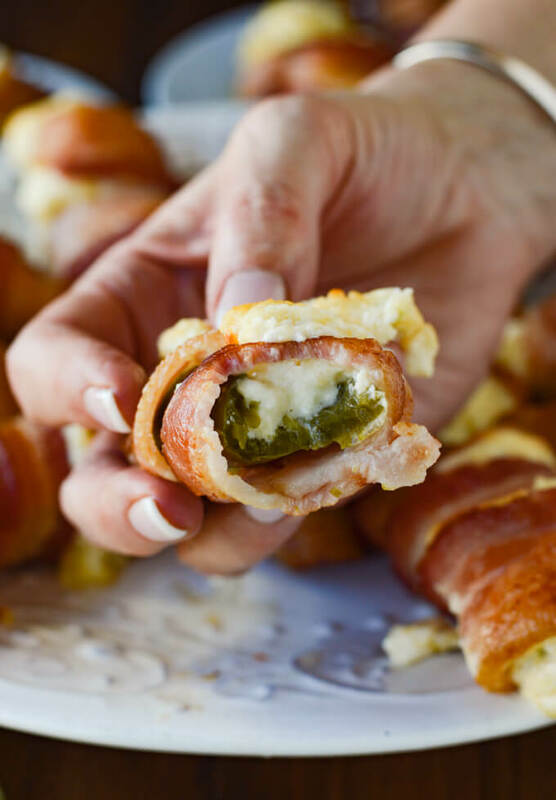 I do love these jalapeno poppers. They’re quite addictive. Thanks for stopping by.